This week we reorganized a little the Teach English Programme since lately the participants in classrooms have been on such different levels that it has brought difficulties for both teachers and students. Kate from the States, Josh from Canada and me created a test to find out how much children know about English. Some of the children who have been attending classes more or less regularly during the past months did unfortunately not know much about English. At the same time some of them knew a lot. Zaira even got 50 points out of 60. As a conclusion we now have three groups A, B and C that are more or less at the same level. Group A is for beginners and most kids in that class are very young. Group C has the highest level and I am hoping to take some of them even out of that group since they are that advanced. Also next weeks seem promising in sense of new volunteers, we have some 5-6 people coming in more or less at the same time and some of them are coming for at least a few months. We are still looking for people who could teach math, help children with their homework (maybe even start a class to help them learn to read), organise our library etc. Read more about opportunities of doing voluntary work in Buenos Aires with us. With a little delay – here are some pictures from Saturday when Conviven’s bands La Culta and Clan Oculto gave with other bands live concerts in the gate of Ciudad Oculta. The crowd of villa people was happy and so were the volunteers of Conviven who came to enjoy some live music, hamburgers and company of local people. I have updated the post "What could you do at Conviven?" with more options for volunteering in Buenos Aires. The list of course is not complete, but I will keep updating it. Hopefully soon I am able to add more specific job descriptions. And a reminder -- Conviven's band is playing tomorrow! Come and hear Conviven's band! This Saturday there's a music event taking place in Ciudad Oculta and you're all invited. Take some time off, come and have a party with us! And also don't hesitate to inform your friends! el momento que estabas esperando ha llegado! As volunteers, we play an important role to help support the work of Conviven, be it for just a week or much longer. Any skills are put to good use be it, sport, creative work, teaching English, music etc. And the children and adults who attend the centre are full of enthusiasm to learn. It is particularly rewarding to see the children make some progress and to be able to build a relationship with them to engender in them some self belief and self worth. The existence of Conviven for the populace of this area is a Godsend, and, Valmir, the organiser and director of the school is worthy of several medals for all the work and effort he has put into making Conviven a success. He is aided and abetted by local people from the area who work unfalteringly to maintain the centre. His "Aide in Chief" is an incredibly hard working lady called Carmen who seems to do everything for everybody and always with a huge smile on her face! I hope that my four weeks at Conviven helped to encourage and boost the confidence of two individuals with whom I worked three times a week to teach English and that through other volunteers they continue to try to strive to learn and have fun doing so. 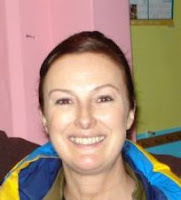 Sue worked for Conviven in July 2007, teaching English. Both of her students still come to learn English three times a week. For about four months I worked as an English teacher in Centro Conviven. I may have taught my students how to form basic sentences and write some words in English, but the real lessons go much deeper – for the teachers as much as for the students. Conviven is not just a school; it is a place where people with few resources can receive some warm attention and care in a safe environment. As a part of the English teaching program at Conviven, I fell in love with the energy, the people, and the ideology of the place. 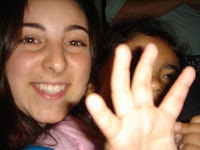 When I first came to Conviven in February of 2007, the volunteer teaching program was completely unorganized in regards to the materials and how to go about teaching English. We had to develop our own curriculum based on the few books we had and from our various previous experiences teaching or tutoring. Together, we sat down to talk about it, and we used various books and our creativity to come up with a basic plan for teaching English to the children and adults at Conviven. We decided to separate the students by level and age. Now there are about thirty schoolchildren and twelve teenagers and adults who come three times a week to study English. Working at Conviven is challenging, and each volunteer has a specific hurdle to jump over. For me, one of the hardest things was working together with a group of volunteers that was constantly changing as new people came and old ones left. Communication wasn't always clear or consistent, and leadership came and went. I had to learn to be less self-centred when I made a decision that affected the group, like not coming to work one day if I was sick or busy. Why do we decide to dedicate our time and energy to teaching at Conviven? Well, each person has his own motive. For me, it's a question of providing some balance in a Latin American country that suffers from the common problem of social inequality. 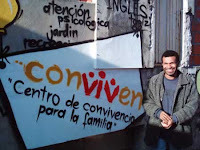 While some people in Buenos Aires have the opportunity to study English – a valuable skill that will help them in life and in their careers - others in neighbourhoods like Mataderos, where Conviven is, don't have the opportunity. Their public schools have less resources and less educated teachers, and at home they aren't always encouraged to study. Another reason for volunteering at Conviven is that it is an interactive experience with people from other cultures and different lifestyles. The teachers learn from the students as much as they teach them. We help the students develop their self-esteem and language abilities, and the teachers have an experience that opens their eyes to the realities of the developing world. Conviven is a place where we "Convivir;" which translates to say that we live together despite our differences - instead of living apart. I only volunteered in Conviven for a couple of weeks, but it is a couple of weeks I will never forget. The first thing you are struck with, as a new volunteer, is the total madness of Conviven. The centre is full of the energy of all the children who attend the classes and the building becomes alive as a result. The children are obviously impoverished and denied the everyday opportunities you and I take for granted. This is why volunteers are so important. Every new volunteer has a skill they can share, along with input from the outside world and different cultures. The fact that Conviven’s structure only exists in a loose sense, means that there is a lot of scope for initiative. The classes are not limited to English classes, if a volunteer has a skill they feel comfortable teaching then Conviven can facilitate this. It is hard work at times, but it is also incredibly rewarding. When you witness the fruits of your labour, you start to realise how worthwhile it is to donate your time and help raise funds for the centre. The staff there has an unfaltering dedication which you can’t help but be in awe of. The centre has so much more potential, and I have no doubt, that with the help of other volunteers and more inventive fundraising, it will achieve this in the not so distance future. 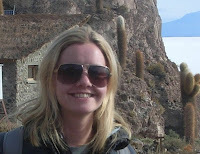 Helen from Ireland worked with us in June 2007. I’ve been building this site for some time now and I feel it’s time to let everyone see it. There are still some pictures missing and a lot of our former volunteers haven’t sent me their stories, but I hope those things will be improving soon. If you see any language errors in this page, I apologize – English is not my first language as you might know. Nevertheless, please inform me if you see any so that I could correct them (kangsepp at gmail dot com). Also if you have ideas how to improve this site, don't hesitate to tell me! Hopefully this site starts to live an active life, letting you know what is happening in Conviven. Working at Centro Conviven was a hugely fulfilling experience. The relationships I built with my pupils, and with the team of volunteers was something unique; like being part of a family. It is not often that you find a diverse group of people determined to fight against the odds to achieve a common goal. I was lucky to be part of this team, and even if only for six weeks, those weeks have been etched into my memory forever! Greeting you at the door is Carmen; she is a grandmother from the villa oscura, and also the founder of Centro Conviven. Like a true matriarch, she was always concerned for us, accompanying volunteers to and from the bus stops, providing students with afternoon snacks, making Conviven a truly warm and welcoming centre to visit. welcomes the students to their afternoon English classes. He is incredibly dedicated to his role as leader of this centre, and is a great anchor for the students, who can always rely on him, no matter which volunteers may be coming or going at the time. During my time volunteering, I saw perhaps forty infants, teenagers and adults walk through the doors for English lessons alone. To be honest, I arrived having no idea how I would be helping and what to expect from the children - nor did I speak much Spanish! All the volunteers met in the preliminary weeks to share what they knew, and together we established our own method of teaching Engllish and running the classes, developing a system that supported all of our strengths and nurtured those of our growing number of students. Before long, at least twenty five students were coming regularly and were assigned to specific teachers and classes, depending on their level and age. Having gone through this program I feel that the impact was so much greater than I expected… I thought I had come to do my small part in giving support to children in need, while on my travels. In fact what I got out of it was the chance to really touch the individual lives of my students and the community, and for them to touch mine. It felt satisfying to be part of the process, strengthening Conviven through our team of volunteers, in a way that will hopefully continue through the years. Although I was the teacher, I also had the unexpected chance to learn a great deal from my pupils; from their way of life and all that they had been through. I saw a thirst for life and learning that I would never had imagined! 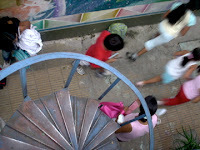 It is clear that this NGO provides a much-needed safe haven from the streets and las villas of Mataderos and Lugano. In a country with so much turbulence, Conviven provides an accepting environment for people of all ages, races and capacities. Through this experience an awareness was born in me… I began understanding on a personal, social and political level what I saw – the plight of the Argentines and of those behind them, the hidden people of the villas...not to be forgotten.